Today is my husband's 56th birthday. It is also Wednesday, so I am sharing what is on my work desk with you! As you can see I have been working on making his birthday card. 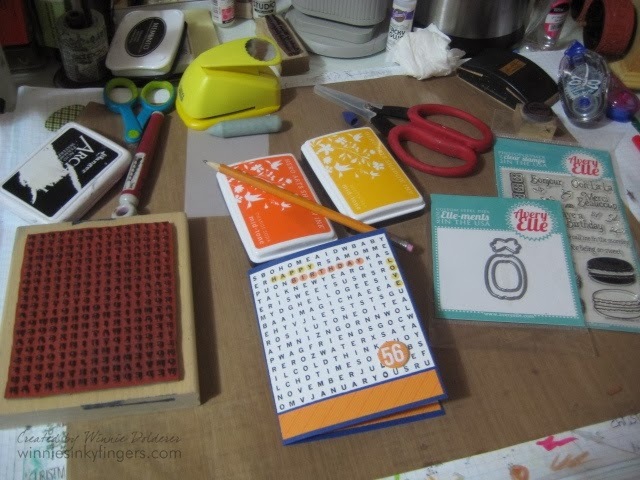 I went with a fun word search stamp that I had for many years by Stampin' Up. I used a pencil eraser to stamp the ink on it. Last month I was a lucky winner at Jennifer McGuire's blog and won a dozen Hero Arts Shadow Inks. I was so very excited when I learned I would be getting them and have been enjoying them ever since. A dozen ink pads to a stamper is such a treat! These inky fingers are extremely happy! Also on my desk is a new stamp set and matching die set I received from my good friend Asia for Christmas. I am planning to use them next to make a birthday card for a very special friend. Thank you to Julia for the desk hopping fun! I look forward to catching up with you today! This is a great card. I have this same background stamp and fell in love with it from the start. It's such a fun way to send just about any message, and your birthday card will have him smiling, I'm sure. Again, your workspace is so tidy! Imoessive! I love the clean look of this card for your hubby! Happy Birthday to him and have fun celebrating! 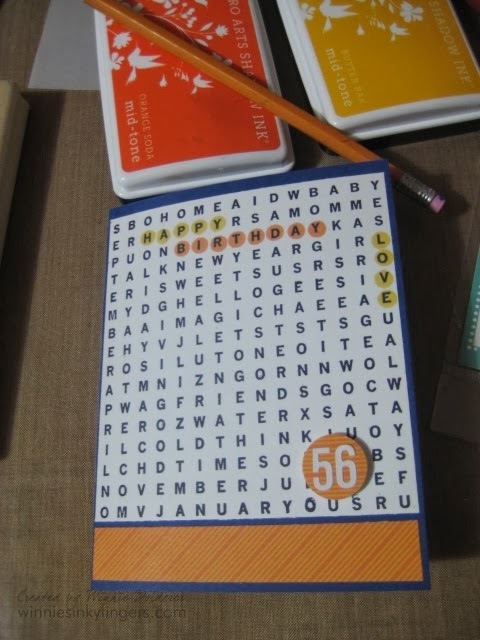 Although I don't have that background stamp it inspires me to use my crossword background to create a few masculine cards for my card stash. Have fun with your new stamps and I look forward to seeing that special project. Have a great week! Happy Birthday to your husband!! I love unique cards like this....my sister-in-law made me one for Easter one year. Have fun with your new inks! Such a nice birthday card for a guy, I'm sure he'll love it. Here in Massachusetts it's a brisk 5° this morning. I'm staying in and sewing! What a fabulous card for any guy! Love it! Now that's creative! Awesome card and happy birthday to the hubs, Winnie! What a super card, I love that stamp! Happy birthday to your husband! And Happy New Year to you, Winnie! I hope it's a great year! uh-oh, you gave away his age!! haha. happy birthday to your hubby!! and congrats on winning those ink pads!! Hello Winnie. I rather like that card - great fun stamp!! Thanks for visiting already and for your best wishes for John. He is improving slowly, I'm glad to say. When I told him about your, and everyone's, best wishes, he positively perked up!!! Take care - I'm all ready for Sunday now, so that's good - but the jumper hasn't grown any! What a fun card and such a good idea to use a pencil eraser. 12 ink pads, lucky you. I particularly like the Hero Arts shadow ink ones because they are really quite unique. Great colours and so useful once you start using them. Can't wait to see what you do with them. Thank you so much for visiting and for your encouragement. Cute card. Congrats on the win of the ink pads. What fun you'll have with those. Well happy birthday to your husband, and keep those inky fingers busy. Happy Birthday to your hubby and what a great card!!!! Congrats on winning the ink pads too - WOWzers!!! Happy Birthday to your dear hubbie! I celebrated my 48th on January 14th.... The years seem to just fly by now! :). Love the card you created for him! What a cool stamp!